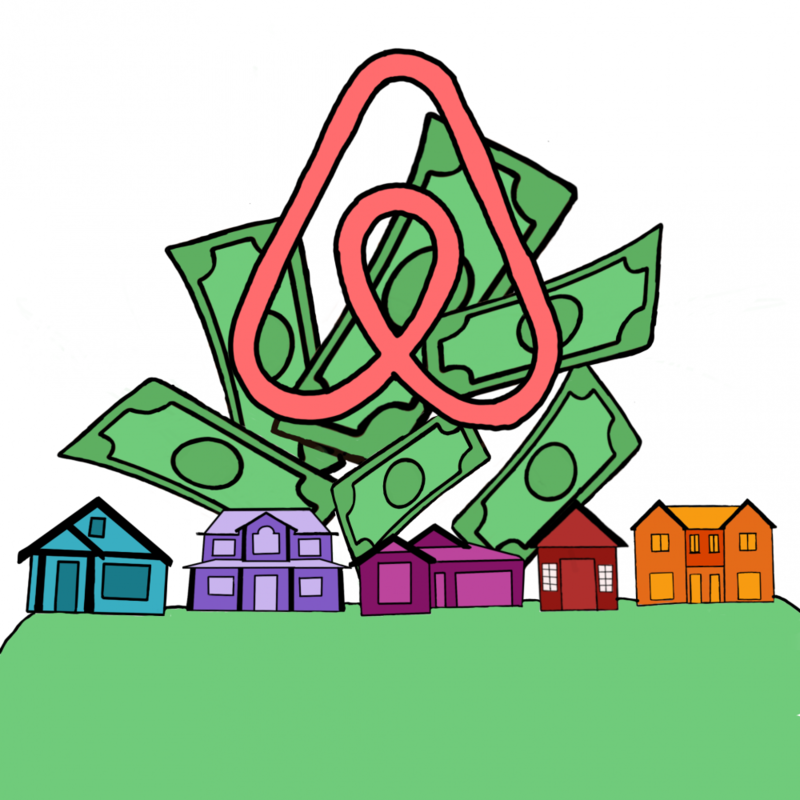 Steve Geisler owns two houses — one for himself and the other to rent out through Airbnb. He purchased Creekside Cottage about three years ago, and it’s about a five-minute drive to Uptown. He bought it from a man who was renting the house on Vacation Rental By Owner, a company that rents out houses and rooms for vacationers. Geisler also started renting it on Airbnb, but he said after he made that change he received three times more business than before. Airbnb prices range from $40 to $250, but some Airbnbs charge extra fees such as cleaning, bringing animals, service or number of guests. Owners choose the price they want to rent their house or room for. Airbnb also adds an additional fee for using the website. As of Jan. 15, there are 130 Airbnbs in Athens. Geisler likes being his own boss and said he’s made friendships with his customers, sometimes grabbing a beer with them when they are back in town or texting them to catch up. Geisler said the busiest times of the year are big weekends at Ohio University, such as Halloween or graduation. Eighty percent of his client base are parents. The people who rent Airbnbs are not always parents, but also students, travelers, sightseers or even once a man coming to take a woman out on a date, Geisler said. He’s had mostly positive experiences, he said, with an occasional bad one. The biggest problem has been people lying about how many are sleeping at the house to avoid a $25 fee for having more than two people. He’s also had someone break his hot tub. Cleanliness is Geisler’s top priority for the house, because if something is dirty or weird, it will show up in reviews. Those other two are cabins Geisler created with Casey Buchanan. They co-own Morning Dew Hop Farm, a farm about 15 minutes away from Athens that grows organic hops and vegetables. Both decided to build three cabins for Airbnb on the property and upgrade one already standing. “He and I invested into building three cabins at my farm. It’s been really successful having people in and out of there for the past three or four months,” Buchanan said. Liz Chamberlain owns Bodhi Tree. It’s an Airbnb run out of her home. She rents by the room. She started it a few years ago when she wanted to become a full-time yoga teacher and needed extra funds. Chamberlain said she chose to transition from a bed and breakfast, as she had originally started it as, to an Airbnb because it made booking easier and was popular. There is still room to grow, Chamberlain said, but she’s happy with it. She has a steady flow of guests and is able to own a yoga studio. “It’s been a great addition to our business and helps us support doing other things we like to do,” Chamberlain said. She said she doesn’t compare herself to other Airbnbs in Athens. She tends to be higher priced than most but doesn’t focus on competition. Airbnbs within Athens are only permitted in zone R-2 (one to two family housing zone) and zone R-3 (multifamily housing zone), according to a 2016 Athens City Council ordinance. Those are houses and buildings built to house one or more families. Those who try to open an Airbnb within those zones will be shut down for code violation. “They’re allowed in certain areas in the city but not all,” Chris Knisley, Athens City Council president, said. Knisley said the ordinance will likely be reevaluated in the future as it has become outdated from the growth of Airbnb in Athens. Athens Township and County are allowed to tax hotel or home lodging up to 3 percent, according to the Ohio Revised Code. Each transaction is taxed 3 percent of the profits. Eight owners are currently paying the tax, as of Jan. 8., according to the Athens County Auditor’s Office. Four businesses paid it last year. The Athens County tax was implemented in the ‘90s, Chris Chmiel said, and the profits of the lodging tax go to the Athens County Convention and Visitors Bureau. 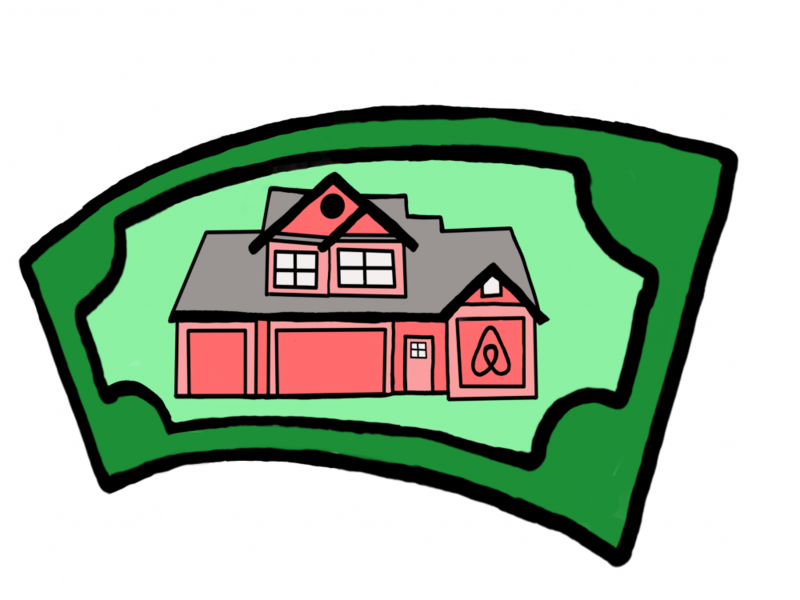 Chmiel, an Athens County commissioner, said most Airbnb owners do not pay the tax. “People start this Airbnb thing, but they necessarily don’t realise there’s a lodging tax that needs to be paid,” Chmiel said. Geisler chooses to pay the tax because he does not know what will happen if he does not. Chmiel himself has an Airbnb and said he will talk to other owners about paying it. He said people may just not be aware. “I will say that when we started talking about this, several more Airbnbs have started to pay the tax,” Chmiel said. Because so few owners pay the tax, Athens County sent a letter to Airbnb to request that the lodging tax automatically be included in fees. That is done in different states and larger cities in Ohio. Chmiel pays the lodging tax for his Airbnb, Integration Acres Farm, a farm located in Albany. He started it a couple years ago when Airbnb first became popular. Chamberlain said she chooses to pay the lodging tax as well. The Athens County Visitors Bureau advertises her business on their lodging page, which makes her feel like it is worth it, she said. “We used to be on the homepage and a lot of people found us that way,” Chamberlain said. Andie Walla, a media arts and studies professor at OU, owns Wallahalla, an Airbnb. She hires someone to do her taxes locally. She said she has had to lower her prices to compete with other Airbnbs in Athens because the market is saturated, but then loses profits when she is taxed. Buchanan said he pays the tax for his Airbnb because he’s happy to support local communities through the money that is earned from it. The Athens County Convention and Visitors Bureau receives 50 percent of the city lodging tax profits and 95 percent of the Athens County tax lodging profits. Paige Alost, executive director of the bureau, said she is not involved in the collection of the tax but in making sure the investment benefits Athens County. Alost said she aims to have visitors stay overnight because they will spend more money, which is why some Airbnbs are promoted on the bureau’s website. Geisler said his only concern is taxes do add up, because he also pays income taxes to the state, along with other fees of being a business owner. Chmiel predicts Airbnb will one day outgrow the Athens market and have too many in one location.